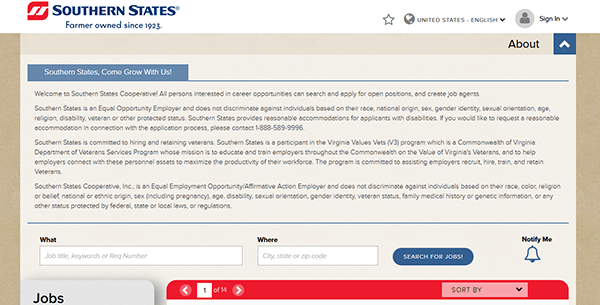 The online Southern States job application is available via the group’s careers page. Follow the links posted on this page (near the top of the page/in the instructional guide) to go to the group’s employment page. When you open the group’s employment portal you will be able to search for current job openings, register for an online account, and fill out/submit applications for any job openings that you want to apply for. About the Cooperative: Southern States Cooperative is an American agricultural supply cooperative that is owned/operated by farmers and agriculturalists. The group was formed in 1923, and is based out of Henrico County, Virginia. 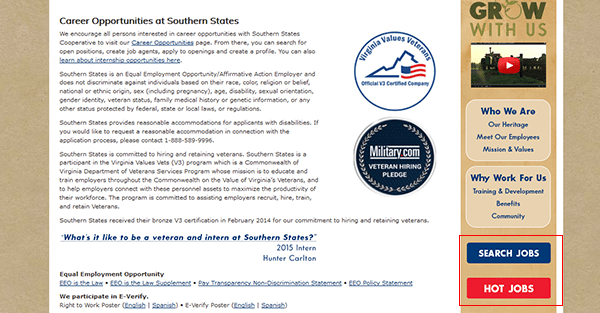 Learn more about the various career opportunities at Southern States by reading the guide posted below. Step 1 – The first step to finding a career with the co-op is to go to the main careers page. Click on this link to have the page load in a new tab/window. Note: If you’d rather skip this guide and go directly to the careers page then click the button at the top of this page. Step 2 – Scroll down the page and hit the “career opportunities” link in the opening paragraph. You will be taken to the main search form/page. Step 3 – Use the search form near the top of the page to look for specific career openings. Scroll down the page to view the list of results. The options on the left side of the page can be used to filter the results/listings. Step 4 – Click the title/link of the career you’re interested in applying for. Step 5 – Review the job description page and then follow the on-page instructions to initiate the application process.